Kaneva is a new social network that extends the concept of MySpace into a virtual world. Although you’ve been able to sign up for a 2D profile on Kaneva they recently opened the doors to their 3D world. The idea is that users can create personal profile pages in the 2D space, like MySpace, but also carry out the same personalization to their virtual world apartments. The social networking site is chock full of all of MySpace’s main features: friends, photos, videos, messages, groups, and personal blogs. Kaneva also gives you control over what your home site and profile look like, using an AJAX editor to drop modules into the page. If you really feel like replicating your MySpace’s horrid layout, you can also dress your profile in straight CSS. Here’s and example profile. Unlike MySpace, Kaneva also includes a voting system, called “raves”, to mark the best profiles, groups, photos, and videos. The virtual world has a kind of Sims or There.com look to it. The architecture of the world is based on warping to different public locations (mall, club…) and your personal apartment. Goods are purchased with a virtual currency. The site gives you some basic hair, color, body, and shape customizations for you avatar, but still has a way to go in order to catch up with the more established SecondLife and There. Your personal apartment serves as your “3D profile”, which you can decorate and use to host parties. However, the really interesting part is how Kaneva ties together their 2D and 3D worlds. 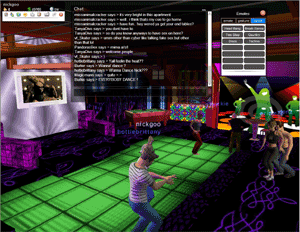 Users can not only decorate their apartment with TVs and photo frames, but also fill those items with content from the site so that you could have your virtual friends over to watch your favorite viral video (click on the screen shot above and note the music video playing in the background). 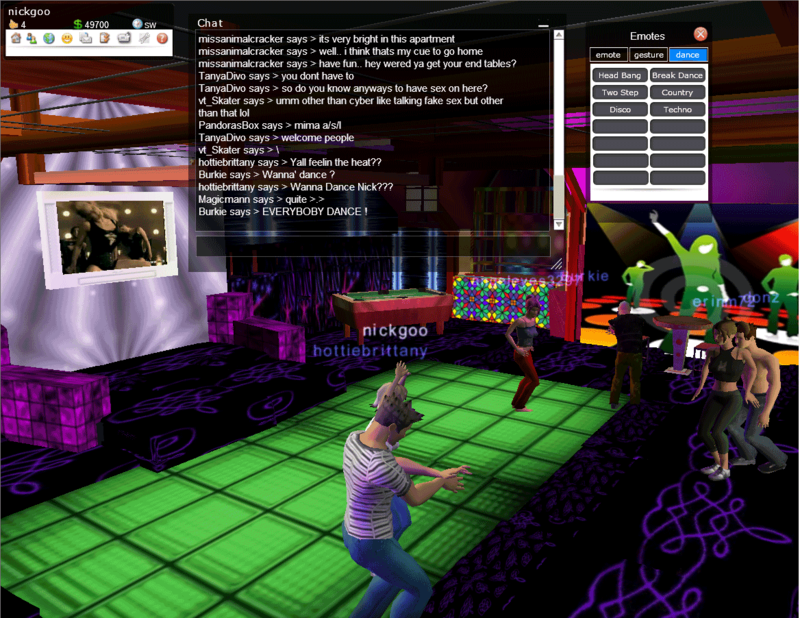 Groups created on Kaneva’s site can carry their meetings out in the virtual world. Kaneva is also working on a quest engine to incorporate games into the world, which will be essential to its success. Currently you can only chat, dress up, and do some basic animations, which is not enough to contend with the alternatives of just chatting online or the more complex game of dress-up SecondLife suppots. Kaneva gives a good twist on social networking, drawing in the younger, non-gamer MySpace crowd into virtual worlds. However, they still have a lot of room to catch up with the established virtual worlds.